This article is about the human mtDNA haplogroup. For the unrelated human Y-DNA haplogroup, see Haplogroup A (Y-DNA). In human mitochondrial genetics, Haplogroup A is a human mitochondrial DNA (mtDNA) haplogroup. mtDNA-based chart of possible large human migrations. Haplogroup A is believed to have arisen in Asia some 30,000–50,000 years before present. Its ancestral haplogroup was Haplogroup N. However, the extant diversity of mitochondrial genomes that belong to Haplogroup A is low relative to the degree of divergence from its nearest outgroups in haplogroup N, which suggests that extant members of Haplogroup A might be descended from a population that has emerged from a bottleneck approximately 20,000 years ago. Its highest frequencies are among Native Americans, its largest overall population is in East Asia, and its greatest variety (which suggests its origin point) is in East Asia. Thus, it might have originated in and spread from the Far East. Its subclade A2 shares a T16362C mutation with subclades A1 (found in Japan, Tashkurgan, Veliky Novgorod, Mongols, and Altaians), A6 (found in Tibet and in the Yangtze River basin), A12'23 (found in Siberia and among Uralic and Turkic peoples), A13'14 (found in southern Siberia, Xinjiang, Ladakh, China, Yunnan, Thailand, and Vietnam), A15 (found in China, Naxi, Uyghur, Japan, and among the Sherpa of Tibet and Nepal), A16 (found in Uyghur, Buryat, Turkey), A17 (found in China, Miao, Yi, Tibet, Ladakh, Kyrgyz, Thailand, and Vietnam), A18 (found in China), A19 (found in China), A20 (found among Han Chinese and in Japan), A21 (found in Tibet and in Jammu and Kashmir), A22 (found in China), A24 (found in Beijing and West Bohemia), A25 (found in Japan and Yakutia), and A26 (found in Denmark). A2 is found in Chukotko–Kamchatka and is also one of five mtDNA haplogroups found in the indigenous peoples of the Americas, the others being B, C, D, and X.
Haplogroup A2 is the most common haplogroup among the Inuit, Na-Dene, and many Amerind ethnic groups of North and Central America. Lineages belonging to haplogroup A2 also comprise the majority of the mtDNA pool of the Inuit and their neighbors, the Chukchis, in northeasternmost Siberia. Other branches of haplogroup A are less frequent but widespread among other populations of Asia. Haplogroup A5 is rather limited to populations from Korea and Japan southward, though it has been detected as singletons in a pair of large samples of Khamnigans (1/99 = 1.0%) and Buryats (1/295 = 0.3%) from the Buryat Republic. In Asia, A(xA2) is especially frequent in Tibeto-Burman-speaking populations of Southwest China, such as Tibetans (6/65 = 9.2%, 25/216 = 11.6%, 11/73 = 15.1%). Approximately 7% to 15% of Koreans belong to haplogroup A. Approximately 5% to 12% of the Japanese belong to haplogroup A (including A4, A5, and A(xA4, A5)). Approximately 4% to 13% of Mongols belong to haplogroup A, almost all of whom are contained within the A4 subclade (2/47 = 4.3% Mongolians from Ulan Bator in haplogroup A4, 4/48 = 8.3% Mongols from New Barag Left Banner in haplogroup A(xA5), 6/47 = 12.8% Mongolians from Ulan Bator in haplogroup A4). Approximately 3% to 9% of Chinese people belong to haplogroup A. Haplogroup A also has been found in Vietnamese (2/42 = 4.8%, including one A4 and one A5(xA5a)). Approximately 4% (3/71) of Tatars from Aznakayevo, 3% (4/126) of Tatars from Buinsk, and 2% of Turkish people belong to haplogroup A. Haplogroup A4 has been found in 2.4% (2/82) of a sample of Persians from eastern Iran and in 2.3% (1/44) of a sample of Tajiks from Tajikistan. Haplogroup A is not found among Austronesians. This phylogenetic tree of haplogroup A subclades is based on the paper by Mannis van Oven and Manfred Kayser Updated comprehensive phylogenetic tree of global human mitochondrial DNA variation and subsequent published research. In his popular book The Seven Daughters of Eve, Bryan Sykes named the originator of this mtDNA haplogroup Aiyana. Eva Longoria, an American actress of Mexican descent is Haplogroup A2. Wikimedia Commons has media related to Haplogroup A (mtDNA). ^ a b Fagundes, Nelson J.R.; Ricardo Kanitz; Roberta Eckert; Ana C.S. Valls; Mauricio R. Bogo; Francisco M. Salzano; David Glenn Smith; Wilson A. Silva; Marco A. Zago; Andrea K. Ribeiro-dos-Santos; Sidney E.B. Santos; Maria Luiza Petzl-Erler; Sandro L.Bonatto (2008). "Mitochondrial Population Genomics Supports a Single Pre-Clovis Origin with a Coastal Route for the Peopling of the Americas" (PDF). American Journal of Human Genetics. 82 (3): 583–592. doi:10.1016/j.ajhg.2007.11.013. PMC 2427228. PMID 18313026. Retrieved 2009-11-19. ^ a b c d Tanaka, Masashi; et al. (2004). 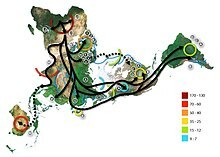 "Mitochondrial Genome Variation in Eastern Asia and the Peopling of Japan". Genome Research. 14 (10A): 1832–1850. doi:10.1101/gr.2286304. PMC 524407. PMID 15466285. ^ Natalia V. Volodko, Elena B. Starikovskaya, Ilya O. Mazunin et al., "Mitochondrial Genome Diversity in Arctic Siberians, with Particular Reference to the Evolutionary History of Beringia and Pleistocenic Peopling of the Americas", The American Journal of Human Genetics 82, 1084–1100, May 2008. DOI 10.1016/j.ajhg.2008.03.019. ^ Marchani, EE; Watkins, WS; Bulayeva, K; Harpending, HC; Jorde, LB (2008). "Culture creates genetic structure in the Caucasus: Autosomal, mitochondrial, and Y-chromosomal variation in Daghestan". BMC Genetics. 9: 47. doi:10.1186/1471-2156-9-47. PMC 2488347. PMID 18637195. ^ Takehiro SATO, Tetsuya AMANO, Hiroko ONO et al., "Mitochondrial DNA haplogrouping of the Okhotsk people based on analysis of ancient DNA: an intermediate of gene flow from the continental Sakhalin people to the Ainu", Anthropological Science Vol. 117(3), 171–180, 2009. ^ Cite error: The named reference Lippold2014 was invoked but never defined (see the help page). ^ "First Americans Endured 20,000-Year Layover – Jennifer Viegas, Discovery News". Archived from the original on 2012-03-13. Retrieved 2009-11-18.